ChristianDevotions.us is always looking for good writers. One of our goals as a ministry is to offer the opportunity to be published to new writers. Our platform is enormous and the arms of this ministry reach great lengths. God has blessed this part of our dream. 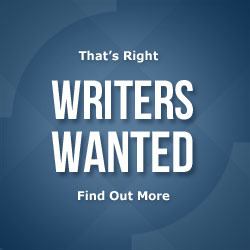 If you are interested in writing for Christian Devotions ( www.christiandevotions.us ) then we encourage you to submit. As Executive Editor, I will see your work is placed in the hands of our acquisitions team who, read, edit and submit back to me completed devotions ready for publication. Our turnover time is 90-120 days depending on whether myself and my editors are traveling for the ministry. Bear with us. We reply to every devotion. The first sign of a good writer is one who follows the guidelines and we have ours too. Click the pdf below to download our guidelines and a sample of the Hook, Book, Look and Took method of writing. 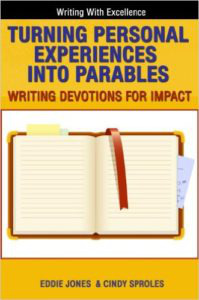 Or you for .99 down load the class we teach on Turning Personal Experiences into Parables: Writing Devotions for Impact. The .99 (after Amazon takes their bite) funds the publication of ministry devotions. Thank you for sharing your time with me at the conference. I’m honored to have been able to share with you. Below are the links to dropbox for each of the Power Point presentations. You do not have to have a dropbox in order to view or download. You simply click the download button and save it to your desktop. Turning Personal Experiences into Parables: Writing Devotions for Impact, you will learn how to write devotions for church newsletters, periodicals, websites and books. A devotional ministry can complement the advancement of a building campaign, mission work and church projects. Learn how to draw readers in with the “Hook, Book, Look, Took” method: a time-tested technique used by best-selling authors. See how to “Write From Your Wound to Their Pain,” craft stories with the authority, speak as a prophet of God, discover your writing ministry, learn the six key secrets every successful writer knows, and much more.